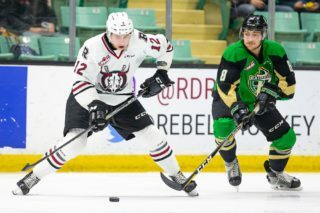 When August rolls around and the Red Deer Rebels open training camp, Grayson Pawlenchuk will be somewhere else than the Centrium for the first time since 2013. 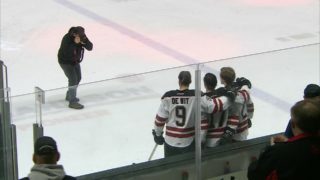 “I don’t think it’s sunk in all the way yet,” the 21-year-old Rebels winger said Monday of the realization that his WHL career — along with that of teammate Mason McCarty — ended with Saturday’s 6-4 playoff loss to the Lethbridge Hurricanes. “It’s still pretty fresh but I’m sure in the next couple of days here it’s going to hit me pretty hard. It’s going to be weird that my five years here is done and that I’ll be moving on to something else. Pawlenchuk made the club at 16 in the fall of 2013 and was a nice surprise out of the gate. “When he came to our team as a 16-year-old, through those first five to six weeks of the year he was our best player,” said GM/head coach Brent Sutter. The Ardrossan native suffered a serious elbow injury in Swift Current early in his rookie season, however, and it slowed his development. “He never really recovered that year. He missed a lot of time and when he came back he was still trying to work through some things with his elbow,” said Sutter. 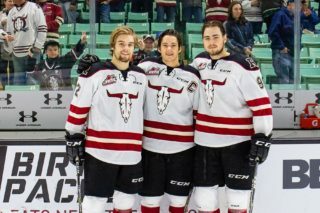 Pawlenchuk finished his first season with seven goals and 19 points in 44 games, then scored nine times and collected 26 points in 72 games the following campaign. He broke through in 2015-16 with 22 goals and 16 assists in 71 games, then missed most of the ’16-17 season due to injury, managing four goals and nine points in just 19 contests. Pawlenchuk’s final season was his finest as he garnered 52 points — including 18 — in 72 games as the team captain. “Pawly was a responsible player who had some tough injuries he had to go through,” said Sutter. Wearing the ‘C’ on his jersey was a point of pride for the six-foot, 186-pound forward. Pawlenchuk, who scored six goals and collected seven assists in 27 WHL playoff games, was the recipient of the team’s humanitarian of the year award this spring. He insisted the time he spent contributing to the community was extra rewarding. 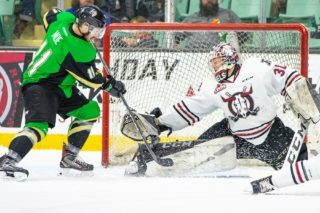 Pawlenchuk attended the Edmonton Oilers rookie camp as an undrafted player last fall and will go that route again in September if the opportunity arises. “It’s definitely on my mind, we’ll just see what happens,” he said. “Hopefully I’ll get a pro tryout somewhere, but if not I’ll definitely be going to school and using the scholarship (money) that I’ve run up. Sutter made several personnel changes prior to January’s trade deadline, but suggested that dealing Pawlenchuk was never an option. “The one thing I never questioned about Pawly is that he’s a great young man and he cared,” said the Rebels boss. “He was certainly a player who deserved to be here for the five years . . . being a Rebel and not playing somewhere else as a 20-year-old. “To have someone in your program for five years is truly unusual. It doesn’t happen very often. A draft pick of the Rebels in 2012, Mason McCarty was brought back to the team last spring, reacquired from the Saskatoon Blades for a second-round bantam draft selection. 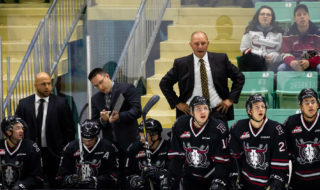 The Rebels looked at the 21 goals he scored in an injury-shortened ’16-17 season with the Blades, then glanced at their own potential roster and realized the Blackie product could bolster the club’s offensive fortunes. “He did that,” said Sutter. “You can say what you want, but he scored goals for us, he got points. “Sure, some nights there were some things in his game you could have questioned, but we knew when we reacquired him there was going to have to be work and time spent with him to improve areas in his game. Indeed he did, sniping 38 goals and garnering 74 points — both team highs — in 69 regular-season outings. McCarty downplayed his personal achievements. “There’s always room for improvement. I think I went on about a 10-game slide there where I didn’t contribute at all,” said the five-foot-10, 180-pound winger. “There was also a couple of nights when I just missed some chances, but that’s going to happen. All in all, you want to try and do as much as you can to help the team. It was also a roller-coaster type of season, with a few highs and many lows during the first half and plenty of positive performances over the final two months. “There was a lot of ups and downs. We weren’t consistent, but at the same time when we needed to be we were good,” said McCarty. McCarty was particularly thankful for the fact he got to participate in post-season play this year for the first time in his WHL career. The Rebels were 12 points out of the final playoff berth in late January, but made up that deficit and more to grab the final spot. McCarty scored once and assisted on three goals in five playoff contests while being physically worked over by the Hurricanes. “In playoffs he took a pounding and it was hard for him because here he is in playoffs, never been there before, and he’s coming off a year where he was our leading goal scorer and point getter,” said Sutter. “Now you’re going into a tough series and who do you think they’re going after? Who do you think they’re going to be hard on? “And he took a beating. He was disciplined for the most part . . . sure he took some retaliatory penalties, but that’s expected. Maybe he didn’t get the points he would have liked to and maybe his plus/minus wasn’t where we wanted it to be in the first round, but he battled and competed hard. And now, six years after being selected by Red Deer in the fourth round — 74th overall — of the WHL bantam draft, McCarty’s WHL career is over. “The boys are all packing up and it’s making me sad,” said the 21-year-old, who is unsure about his immediate future.